A young princess called Helle learns that she and her cousin were switched at birth and that she is the true heir to the Kingdom. However her uncle, who has been posing as her father all these years, has designs on the throne and Helle is forced to flee, seeking allies to build an army and take back her lands. Viking/Medieval genre films are still popular at the moment, riding the coat-tails of the fantasy series Game of Thrones as well as the more grounded Vikings. The trouble is that most productions can't hope to compete with even the budget of one episode of Thrones, despite what their fantastical dvd covers might promise. Of Gods and Warriors can't compete with such things and it would be churlish to compare them. However, it is definitely one of the better Viking genre movies to come out in a while. When King Asmund of Volsung's wife dies during childbirth, he rashly agrees to switch his newborn daughter with his brother Bard's recently born son. Having a son would make the King look stronger and lessen the chance of repeated attacks on his Kingdom. However, his "son" grows up to be a weak and cowardly young man, whereas his "niece" has secretly trained in combat all of her life. It is Helle's combat skills which help lift this film head and shoulders above its contemporaries. When we first meet Helle as a young woman, she is in the midst of what seems to be a fight to the death. A mix of physical skill (actress Anna Demetriou knows how to handle a sword while her stunt double Rubie Planson makes sure Helle can take a bit of punishment as well as deal it out) good choreography by action director Jude Poyer, great filmatism behind the camera and some decent editing. This first encounter is very polished indeed. Anna Demetriou continues to impress with her dialogue scenes too. An encounter with King Asmund is a very well written scene which could have popped out of just about any Disney movie (the king initially mistakes her for a serving girl because she's doing chores). Not everything works unfortunately. There are lulls where the low budget sticks out and the use of a digital camera in a forest setting makes latter scenes look like cosplay/Renaissance Fayre, and there are some cringeworthy dancing/festival scenes which are cringeworthy to watch. I was going to criticize Terence Stamp's performance as Odin. As much as the film is proud to have him in the cast, I considered his performance to be…detached. But then I began to think that this was on purpose. He is after all a God, an eternal being - perhaps "detached" would be his natural persona? Murray McArthur has a lot more fun playing Loki, reminding me a lot of Merlin from Excalibur and I personally loved his final twist at the end. 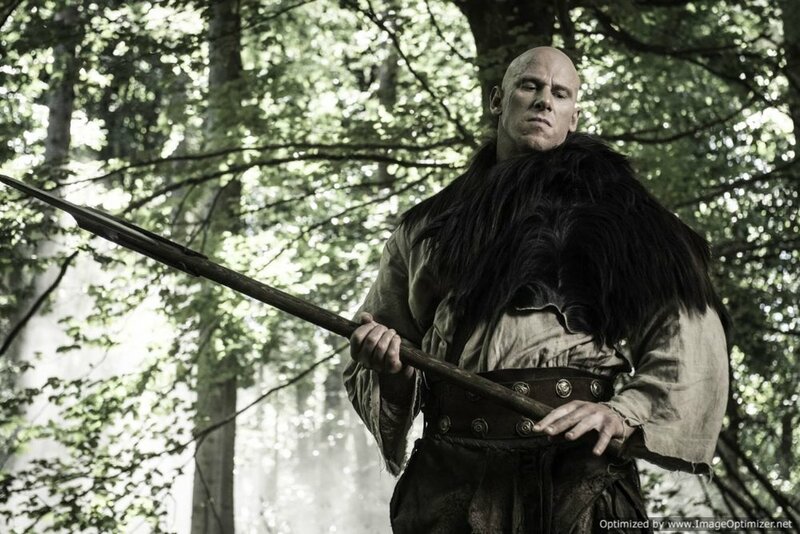 Also providing excellent support is the larger than life Martyn Ford, who plays the twins Torstein and Steiner, and gets a couple of decent fight scenes as each. My favourite film in this genre remains Northmen: A Viking Saga, but Of Gods and Warriors is the only one I've seen recently which comes anywhere close to that standard. Anna Demtriou definitely makes an impression and knows how to handle a sword, and I'm definitely interested in seeing where she ends up next. There are a few lulls in the story but overall this is very good and delivers a very high standard of action in front of the camera and strong filmatism behind it.